For some reason, strawberry season seems to have gone on much longer than normal this year –and of course, I always buy too much and end up trying to figure out what to do with it all. I end up slicing and freezing a ton, but I also keep a supply of homemade preserves in the fridge. 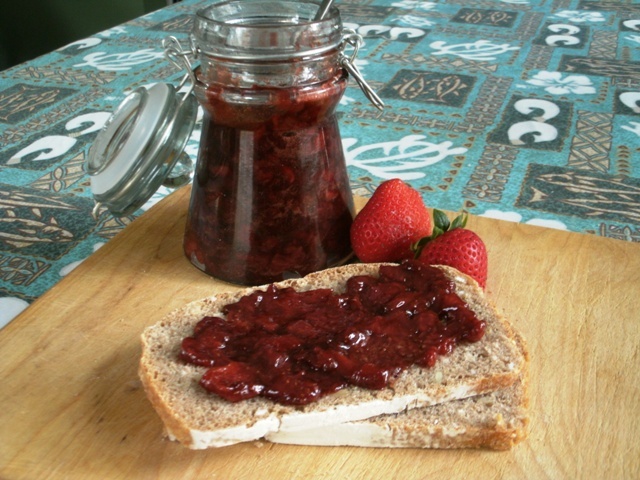 Preserves are incredibly simple – just fresh fruit, sugar and a little extra acid. Something like lemon juice bumps up the pH enough to discourage all the little nasties from feasting on your strawberry preserves while they sit in your fridge. But lemon juice seems so boring. Instead, I started using balsamic vinegar in place of lemon juice. It adds such a depth of flavor to the strawberries (and a depth of color) that seems to keep it from being boxed into the breakfast realm of toast & jam. It’s great on ice cream, and there’s a great use for them coming up in the next post: White Chocolate Strawberry Souffle. Make sure you take a look. Add ingredients to a medium saucepan and place over medium heat. Cook for 45 minutes, stirring occasionally. Cool completely and transfer to container with a tight lid. If strawberries are out of season, this recipe works perfectly well with frozen berries too. This entry was posted in Cooking and tagged condiment, gift. Bookmark the permalink.